Fly fishing has slowed down a little in places but if you take the time and look you will find them and the tip is in the bait report go where the bait fishermen are going the fish are there!! Start using the larger flies and start slowing down on the retrieve let that flie sink a little. If you have any patient’s try a large dry with a nymph dropper let it drift. 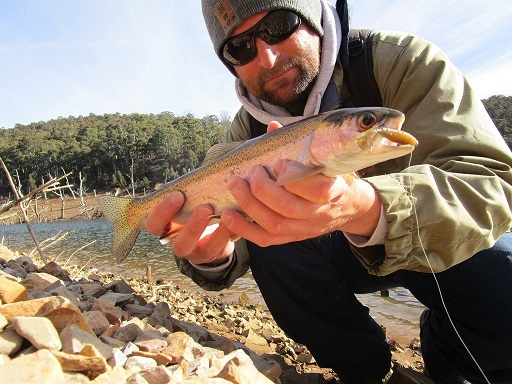 Jindabyne can be one of the hardest place to fly fish at times but if you but the time in you will be rewarded well. at this time off year don’t look for the fish cast cast cast look for structure are the lake ( Rocks, Trees, Stumps, Weed ) use a slow retrieve. At the moment we have been getting some good reports again look at the bait reports to where the fish are that helps. So after yesterdays disappointing donut, I was keen to redeem myself, and hopefully score a few nice fish today. I was also keen to fish some different areas, and fish deep water. I have been concentrating a lot around the shallow bays and coves, and have been having quite a bit of success, but a change of scenery was in order. 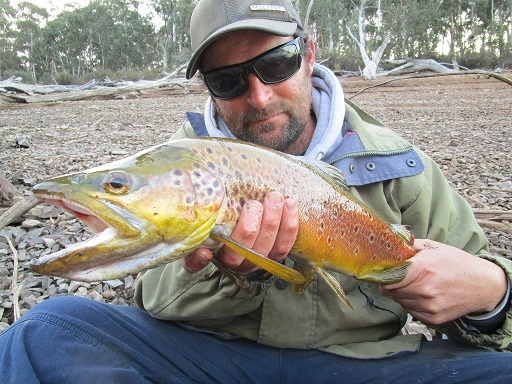 The shallow flats fishing is a very visual, and exciting way to catch trout, as they go nuts in the shallow water, but I haven't flung a hard body lure around in quite some time, and was keen to. Waking to another mega frost, I did some things online, and waited for the sun to rise a bit, thus bringing a warming glow, and making fishing a lot more comfortable. I had some deep areas in mind, and I hadn't fished that area for a long time. On arrival, the waters surface was slightly riffled by a gentle breeze, making for some pleasant conditions in which to wander the banks. As I walk down the steep, and loose rock bank, my hopes were high, and I was keen to tangle with some fish! I had the silver wobbler on my clip from yesterdays outing, and as customary, I left it on, and began prospecting. I began by casting out wide, and letting the lure sink for 5-10 seconds before beginning my retrieve. I could see through the crystal clear water at my feet, and knew the bay was quite deep, so letting the wobbler sink would get it close to the bottom without snagging on the many dead trees and fallen timber. I had punched out two casts into the middle of the expansive bay, when I thought, what I am doing? I usually start with casting hard up along the edges, and then work my casts out into the deeper water. Casting along the edges first at every new spot I walk up to has yielded great results in the past, as any fish cruising in close would have not swum past, and be disturbed by my presence. My third cast then soured along the bank, landing about 3 metres out from the edge. I began my retrieve, and about 3 or 4 cranks into the retrieval it felt like the wobbler ran through a patch of weed. I lifted the rod tip, and yanked back on the line, when the water on the lakes edge came alive! haha it's a fish! It was a subtle take, obviously grabbing the lure, and swimming in the same direction as it. The fight was less subtle! It thrashed around on the surface, throwing water up onto the rocks bank side. It then turned out to deeper water, and peeled line off my spool. Its energetic fight was fairly short lived, and I had it dogging it out at my feet pretty quickly. It had a couple of tail thumping bursts which saw it dive to the bottom, and thrash its head violently. I could see the single hook of the wobbler wedged firmly in the corner of its jaw, so I wasn't concerned with trying to net it quickly. It didn't take long after that to get it in the net though, and I was scrambling back up the bank. It was a fairly slabby fish, but had beautiful colours, obviously a product of the environment in which it was inhabiting. A few quick pics, and back in the drink it went. The morning was an absolute cracker weather wise, barely a cloud in the sky, and the sun shinning brightly. This enabled me to see into the crystal clear water easily. It was like looking into a fish tank! The bottom was covered in weed that was a beautiful shade of green, and littered with fallen timber, a perfect mix of habitat, and cover for the fish. This area looked great, and after 3rd cast success, my expectations were high! I continued on, slipping, and sliding my way over the loose rocks on the steep bank. I decided to change over to a small paddle tail, grub style SP, sink it close to the bottom, and slow roll it back, pausing intermittently to keep it close to the lake floor. It wasn't long before the SP was just coming back into sight from the depths, when a large dark shape emerged from the dark water following it. It looked big! As it got closer I could see it was a fish of at least 7 or 8lbs, and chunky! I was running out of line quickly, and paused the plastic. The fish turned quickly, so I started the limited retrieve, and it spun back around, had a look, then swam off. Dam! That was a horse, and would have been great to hook. Ohh well, they don't get big by being dumb! I continued on after a couple more casts to see if I could entice the beast back, but to no avail. I was casting at some standing timber not far from the shore, had let the plastic sink to a desired depth, and had started my retrieve, when tap. I immediately stopped the retrieve, when I felt another tap, then bang! Fish on! It swam around erratically, and didn't feel like a big fish, but still managed to pull some drag, so my thoughts were, rainbow. As it neared the bank, I could see my guess was right, and I soon landed a spirited little rainbow. They pull so hard for their size, and are always great fun to catch. A few quick pics, and away it went. As I wasn't seeing hardly any sign of yabbies, or yabby beds in this area, but was getting a lot of small fish of around 6-10 inches long following my lures in. This got me thinking about what the big fish in the area would feed on predominately. There obviously would be yabbies in the area, as they are everywhere in the lake, but some areas have a higher concentration than others. 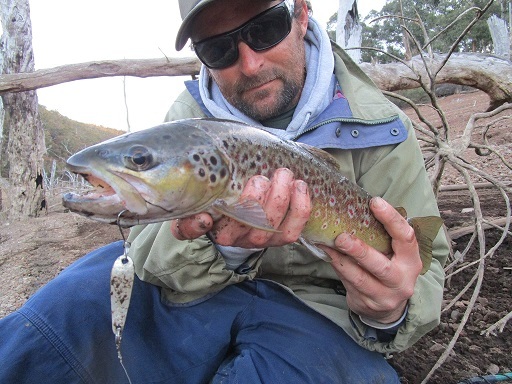 In the low concentration areas, the trout would have to supplement their diets with what ever else they could find. And I was thinking with such a high number of juvenile fish here, the big browns would have to predate on them if the chance arose. So I decided to chuck on a hard body, and have a crack with that. It didn't take long to get some attention, with a solid thump on one retrieve. This heightened my enthusiasm, and anticipation to score a fish on a hard body. I kept prospecting, casting along the edges, and in amoungst the dead trees. I soon had another solid thump, then whack! It grabbed the lure, but quickly managed to free itself, dam! Well at least it was getting attention, and I continued on. I was just at the end of one retrieve, and was 2 or 3 metres away from lifting the lure out of the water, when a dark shape shot out of the depths, mouth agape, and smashed the lure. It inhaled the minnow, and turned quickly, thrashing its body from side to side. In all the thrashing, it somehow managed to dislodge the hooks, had a couple more contorting thrashes, and swam off. Gees, these fish are masters at throwing the hooks I thought, as the hard body had 6 hook points, and it managed to negate all of them. It was nearing lunch time by then, and I wanted to drive out to another spot, and have a bit of a scout around for future reference. I spent the next hour casually walking along the banks in another bay littered with dead trees, and steep banks. I didn't want to spend all afternoon there, so soon made my way back to where I had fished earlier. I returned to the bay, and made a bee line for the far end of it, and around the other side where I had not yet fished. I decided to walk as far as I wanted, then fish my way back. After a fairly long walk, negotiating, and weaving my way through the jungle of obstacles that line the even steeper bank, I was at my end point, and starting fishing. This side of the bay had more small, old, dead shrubs on the water line, making access, and retrieval lines more difficult than earlier. I persisted at it, hoping this more structure lined edge would harbour some more fish. I had fished for a fair while without any interest, and was wondering if the bite had dropped off, and the fish had shut down. 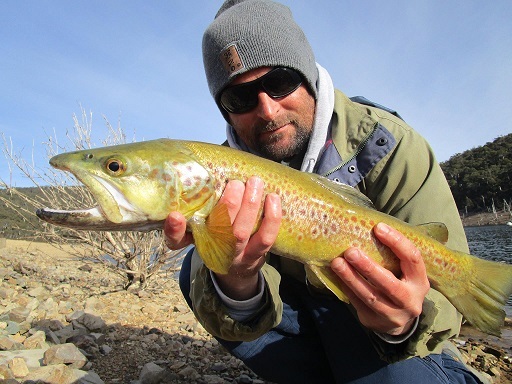 I was ever hopeful that the opportunistic nature of the trout would prevail though, and I would soon connect with hungry, aggressive, or curious fish. 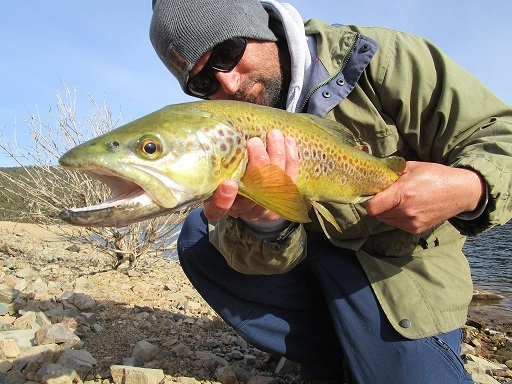 The sun had dipped below the mountain tops by this stage, and I had opted for a slightly different metal lure, a silver spoon that hadn't been modified, and had a nice wide wobble. I was standing fairly high on one part of the bank, holding my rod tip over some structure right on the shoreline, and just as I was preparing to lift the spoon over the dead shrubs, out of no where a fish engulfed the metal. The water came alive, and the fish thrashed violently. It dived hard pulling a lot of drag as it did so. I quickly manoeuvred my way down to the waters edge sinking up to my ankles in mud. I had to hold my rod tip out as far as I could, and try to convince the fish with some pressure not to bury me in the snags. I somehow kept the fish out of all the structure, and was holding my net out in the water, hoping I could get its head up, and sliding in. It didn't like the look of the net, and dived again. After several more attempts, I finally got it in the net, and was fumbling my way back up the slippery slope. Another nicely coloured brown. These fish had a beautiful dark green back, and brilliant bronzy coloured flanks. Love the look of the fish coming out of deep dark water! A few quick pics, and it shot off back to the depths. I continued on, focusing mainly on really close in on the edge, but occasionally punching a cast or 2 out in the timber. I hadn't fished long after the last fish, when like the last one, I was just about to lift the spoon out of the water, when a fish raced out of seemingly no where, opened its gob showing me the white of its mouth, and inhaled the lure! That was awesome! Close quarters combat at its best! I again sunk deep into the mud trying to get close to the edge as the fish thrashed, and writhed around trying to free itself. As I settled in the spot I was going to land it, it shot up out of the water tail walking across the surface, and coming down with a slap. This one was strong, and didn't want to give in. It went aerial a few times, and pulled a heap of string before I had it close enough to net. More obstacles to negotiate, and a near missed netting had my heart in my mouth, but eventually it settled enough, and I had it. You beauty, I was stoked. Loving this challenging fishing, with all the odds in the fishes favour, but somehow managing to extract them. A few more quick pics, and it was back in the water. On to the next spot, and I lobbed out a cast along the edge with a back hand cast as to avoid smacking my rod on some branches. The bottom here was littered with horizontal structure, and the spoon holds itself up nicely in the water, gliding over the top of it. As the spoon came into sight, a fish shot up out of the structure, and nailed it! Wow, another one! This is unreal I was thinking. As it turned broadside, and thrashed about, I could see, and feel it was a better fish. It put its head down, and screamed line out, thankfully over the fallen timber, and out to the left away from any line breaking structure. The powerful head shakes, and tail thumps were being transferred through the line, and down to my hand making my heart beat a little faster. As it neared me I could see it was another beautifully coloured fish, this one was striking! My boots sunk deep into the soft edge, as I positioned myself for a landing spot. Net at the ready, but the fish had different ideas, and wasn't going to be cooperative. It thrashed, and writhed about, then would dive hard pulling line back out into the bay. Come on I was thinking, I really want to land this one. After what seemed like an eternity, I had its head up, and into the net it went where it promptly went nuts tangling itself up. I quickly sorted out the mess, and had myself positioned for a couple of quick pics. It was soon back in the water, and revived quickly. It was a cracking brown of what I estimated to be 4-4.5lbs, and one for the photo album. What a cool looking fish I thought, and it made a great account of itself as well, happy days! After that, light was fading quickly, and I had a lengthy drive home in Kangaroo, and Wombat central, so I legged it back to the car happy with this afternoons efforts. I love exploring a newish area, and coming up trumps. I had a great session, on an absolute pearla of a day. Couldn't be happier! Again the lake is starting to drop but it hasn’t stopped the fish smashing the lures all reports are coming from the bottom end of the lake in close and out wide Middleing Bank, Seven Gates, Rushes Bay, Braemer Bay. Now the weather is cooler most trollers are fishing most off the day early late it doesn’t matter just rug up. Overall it’s still fishing well and the days have been great. 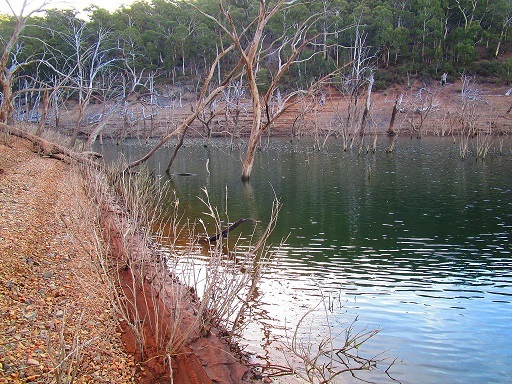 Best areas are down towards the dam wall, East Jindy, Edwards Bay, Hatchery Bay , Kalkite. 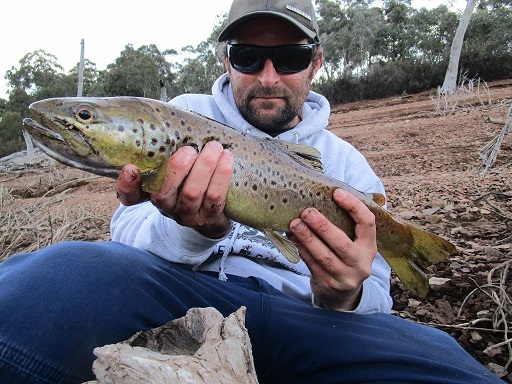 Things are starting to look good around the lake with some good reports coming in most reports are coming in from the top end with the browns and down around Jindabyne good reports with rainbows around Hatchery bay, Edwards Bay and around the Islands. This lake can be one off the best lakes to fish in winter and it’s looking pretty good at the moment. Reports have been fish are still moving around close and out in the deeper waters looking for worms in close and out deeper for the power bait. Overall Middleing bank has been the spot to fish. Best areas are Kalkite, Poo Bay, Hatchery Bay, Waste point and around the Caravan park. Not sure what’s going on with this lake in summer it was very hard to fish but now it’s fishing well maybe the cooler waters are doing the job but it’s great to see things are starting to happen love this lake when it’s on. 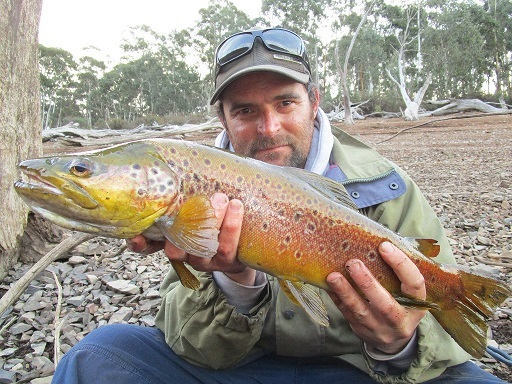 If you are after some brookies and some good ones try around Curiosity rocks up in the arm fishing well! !